The Bulgari Hotel Shanghai melds an early 20th-century landmark building with “true Italian style”. Italian jeweller Bulgari’s hospitality offerings were boosted this summer with the opening of the Bulgari Hotel Shanghai, whose 82 luxurious rooms and suites occupy the top eight floors of a 48-storey tower affording spectacular views of Pudong, the Bund, the Huangpo River and Suzhou Creek. For many, however, the jewel in this Shanghai crown is set at the foot of the tower in the form of the 1916 Chamber of Commerce Shanghai building, which has been meticulously restored to its former glory by Italian architectural firm Antonio Citterio Patricia Viel to house the hotel’s ballroom, Chinese restaurant and whisky bar. Surrounded by private Italian gardens, the columned brick structure’s carved wooden doors open into a magnificent hall with a 10-metre-high ceiling and dark oak floors. Skylights flood the venue with light while sculpted wooden staircases lead to a mezzanine balcony with decorative cast-iron railings that run around three sides of the space. The fourth side is taken up by a proscenium stage dominated by two large circular canvases by artists Liu Xiaodong and Ming Yanpei. It was in this sumptuous space, with its blend of Italian design and Shanghainese historical decor, that we met Bulgari CEO Jean-Christophe Babin. The Bulgari Hotel Shanghai is the sixth in the Bulgari portfolio since the first opened 15 years ago, which seems like a very measured and gradual rate of expansion. Yes, I agree. To do things well takes time. The vision and approach to hospitality is similar to the creativity behind a high-jewellery necklace. We’re bringing together single gems which have never been seen before and combined to create a work of art that remains forever unique. We have six hotels right now, with Shanghai being the most recent precious gem. We recently announced three more to follow in Paris, Moscow and Tokyo, and there are more in the pipeline. What are the criteria for finding the right building in terms of heritage and history? 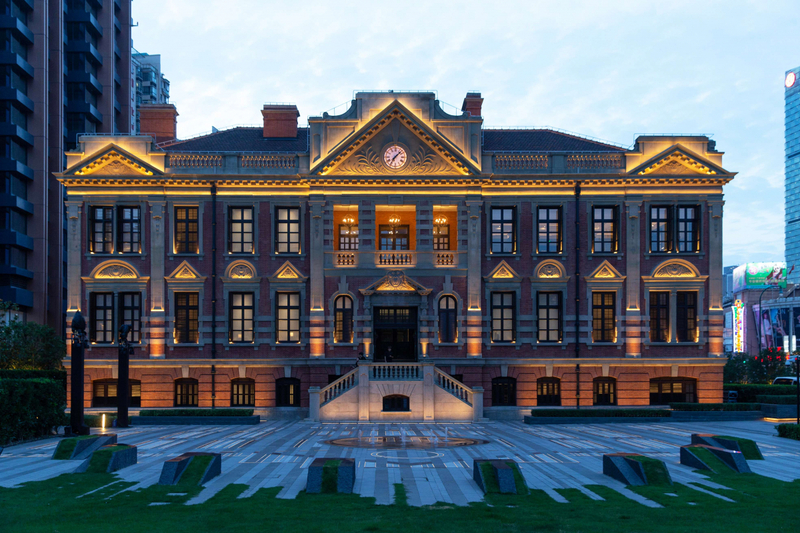 For Bulgari, Shanghai is similar to Milan, and the Chamber of Commerce, with its neoclassical renaissance style, is probably the best-preserved landmark of old Shanghai, and connects quite nicely with Bulgari’s Roman roots. In China banqueting is important, and the building has allowed us to create a unique 500-square-metre Bulgari ballroom, the centrepiece of this heritage icon. It will once again be the home to Shanghai’s most dazzling fashion shows, society dinners, private celebrations and wedding banquets. What makes a Bulgari hotel different? I think it’s the unique mix of hard and soft. Hard in the sense that we really express true Italian style through interior design and also through the unique locations. When you take in the interior everything is delicate, sophisticated, crafted and conveys a sense of understated luxury. On the soft side it’s very much about the emotional quality of service, which is very casual and creates a sense of home from home. You partner with Marriott in your hotel operations. How does this partnership work? We work collaboratively with Marriott as a joint venture. The partnership brings together the five-star expertise of Marriott and the ultra-luxury refinement of the Bulgari brand, which takes the hotel to another level by blending Italian glamour with distinctive Chinese culture elements to provide guests with a truly unique, tranquil Bulgari lifestyle experience away from the hustle and bustle of the city. How important to the brand are cultural activities such as your sponsorship of the Shanghai International Film Festival or helping to restore the Spanish Steps? Is there a direct feedback in terms of creativity? Bulgari loves to be associated with creativity through art and film, and has been an integral and passionate supporter of the film industry since the 1950s. We’re very proud to be part of China’s premier film festival and to have the opportunity to bring the charms of Italian classic cinema to a mostly Asian audience through the Shanghai International Film Festival partnership. In the second year of this very special collaboration we continue to convey the importance of the history of Italian cinema, showcasing a slice of Western life with a different perspective from that conveyed in American movies. With the Tribeca Film Festival we sponsored two short movies from female filmmakers whose work deals with subjects outside of the expected. The Litas, directed by Nina Meredith, tells the stories of three female characters who are passionate about motorcycling, while Conducting a Revolution, directed by Bella Monticello, describes how Speranza Scappucci breaks through in a male- dominated world by becoming the first female to hold the post of principal conductor for the Opéra Royal de Wallonie. Bulgari seems dedicated to old-school values of traditional craftsmanship. Is the typical Bulgari client changing? Which are your key markets today? Generally speaking, the audience tends to be younger, in particular in China. This is interesting for us because jewellery is directly linked to life-stage celebrations. With the brand resonating at an early age, it ensures Bulgari becomes more relevant and is integral to key turning points in life’s journey. Our key markets have not changed that much. We have invested in Europe, China and Hong Kong; Japan also remains important along with the United States, where we’ve redesigned the flagship store on Fifth Avenue. Bulgari’s portfolio now includes wristwatches, leather goods, accessories, fragrances and hospitality. Do you still regard Bulgari primarily as a jeweller? First and foremost, and forever, Bulgari is the magnificent Roman high jeweller, and this is the foundation pillar of the brand. In such a buoyant market this position is as important now as ever. While crafting precious gems and metals we can also become a jeweller of hospitality. The vision is all about the art of crafting gems of nature, just like Niko Romito, one of the world’s most celebrated three-Michelin-star chefs, who brings together the finest ingredients of great Italian classics to create the Bulgari Menu at Bulgari Hotel Shanghai’s Il Ristorante. With the Octo Finissimo, Bulgari recently unveiled the world’s thinnest automatic and tourbillon wristwatches, which is a remarkable technical achievement for a brand best known for high jewellery. In an age of mobile phones and smartwatches, why are such achievements relevant? If you look at sales volumes, fewer people wear smartwatches compared to classical. While Apple are doing well, Swiss watches remain very successful. As humans, we’re fascinated by technology and also the craftsmanship behind the technology. The Octo Finissimo goes beyond the technology, representing masculine elegance in a classical way, making it a unique object of desire. Read the full story in the September 2018 issue of Prestige Hong Kong.